Standing forward bend is part of the sun salutations, which serve to warm up the body at the beginning of most yoga classes. The Sanskrit name for this pose is Uttanasana, which translates to “intense stretch pose”, and for good reason. As you fold yourself in half you experience an intense stretch in the entire back of the body. Also referred to as standing forward fold, this pose is also an inversion because the head is below the heart. Therefore, it can be calming to the nervous system and a welcomed respite between vigorous flow sequences. Standing forward bend stretches the hamstrings and calves while strengthening the quadriceps. This pose can help to release back pain and spinal compression from sitting. Forward folds can aid in digestion, may lessen menstrual cramps, and are known to be grounding for the yoga practitioner. Start at the top of your mat in mountain pose. Inhale, raise your arms straight up turning the triceps forward. Exhale, hinge at your hips and reach for the floor. 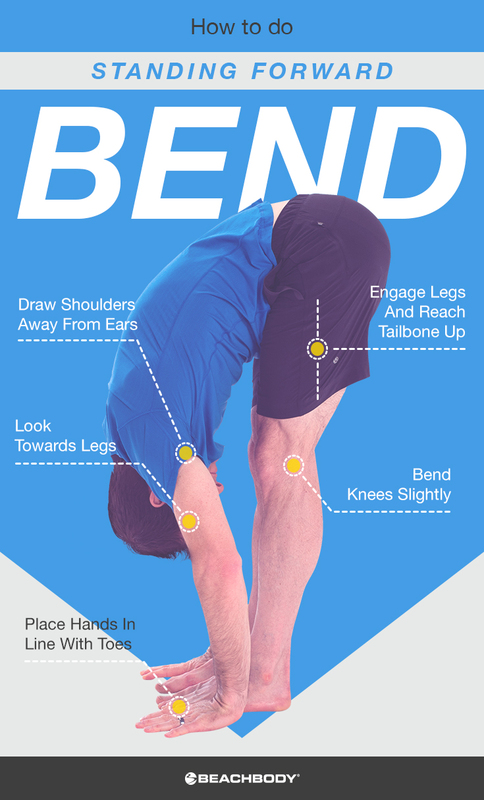 Bend your knees slightly, fold your torso over your legs, and lengthen your spine the whole way down. Bring either your fingertips or palms to the floor, fingers in line with your toes. Spiral your shoulders to the sides and away from your ears. Engage the legs by lifting the kneecaps. Lift your tailbone up toward the ceiling as you rotate your thighs inward. Shift your weight slightly forward on your feet so your hips align over your heels. If you can, begin to straighten your legs. Bending the knees will help get the pelvis to lift up and over the thighs easier, especially if you have tighter hamstrings. If you want this to be easier and more stable you can separate your feet hip distance. If you can’t reach the floor, place blocks underneath the hands. To go deeper into the pose, bring your fingertips to the sides of your feet in line with your toes and then press palms into the floor. To create more of a challenge, work on straightening the legs while keeping the chest close to the thighs. You can find standing forward bend in many Beachbody On Demand programs, such as 3 Week Yoga Retreat and Beachbody Yoga Studio.